A journalist, author and public speaker, Nicholas Kristof is represented exclusively for speaking engagements by Boston-based American Program Bureau. 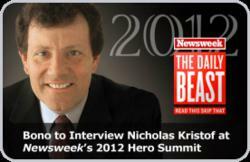 Two-time Pulitzer Prize winner and public speaker Nicholas Kristof will be interviewed by U2 lead singer and activist Bono as part of Newsweek and The Daily Beast's Hero Summit, an invitation-only theatrical-journalism event on November 14-15 in Washington, DC. The summit will allow active and retired US military members, historians, and writers to share their stories about moral and physical courage under fire. Bono will interview Kristof, in a segment called "A Conversation with Bono and Nicholas Kristof." Nicholas Kristof is an award-winning New York Times columnist and co-author of 'Half the Sky: Turning Oppression into Opportunity for Women Worldwide' along with his wife, Sheryl WuDunn. The book, which addresses maltreatment, marginalization, and brutality toward women, was recently turned into an acclaimed PBS series. Organizations who are interested in bringing keynote speaker Nicholas Kristof to speak at their next event should contact American Program Bureau at 800-225-4575.